We are beyond excitement, shaping, making, sewing, devising, performing, fitting, re-imagining, composing and constructing. We can’t wait to show you our new images and characters, to play for you our new melodies, to light for you our fires and take you to a world on the edge of things, for one night. As is the way with Macnas parades, everyone is invited to come out and play, to dress up in costume and celebrate Samhain, the point in time where two worlds meet, where characters dissolve and creatures are remade. ‘Symphony for the Restless’ is a wedding and a funeral; it is intoxicating, disorientating and lawless. New priests and madmen whistle and unleash from the shadows a haunted air summoning the slumbering descent of countless agitations as they close the night upon the city like a trap door . 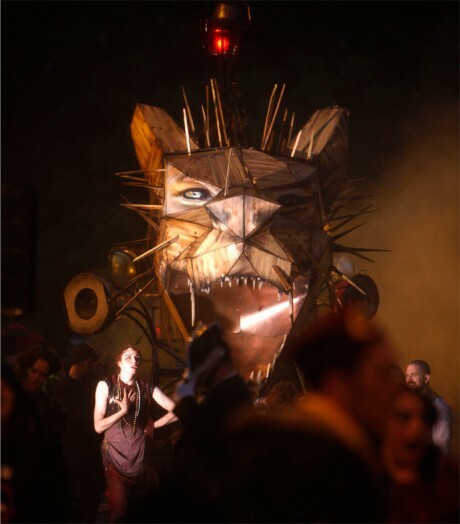 . .
Macnas is an acclaimed, award-winning international performance and spectacle company based in Fisheries Field, recently described as ‘simply stunning’ by the Huffington Post. You can still donate to this year’s parade until this Friday 10th October by clicking here or volunteer to help out on the day of the parade and be part of the magic by emailing roisin@macnas.com with your name and phone number. This year we are proudly supported by our partners Galway City Council, The Arts Council, Latin Quarter, Fáilte Ireland and the Wild Atlantic Way. ‘Symphony for the Restless’ brings our intoxicating lawlessness out onto our home streets of Galway for the biggest Macnas production of the year. Do not miss it.